PanARMENIAN.Net - Armenian Prime Minister Nikol Pashinyan has arrived at the Élysée Palace where he is holding a meeting with French President Emmanuel Macron. After the official reception ceremony, the two will hold negotiations during a working dinner. The meeting proceeds behind closed doors. 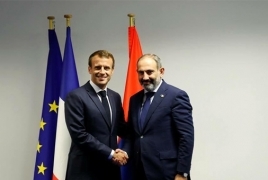 As reported earlier, an Armenian government delegation headed by Prime Minister Nikol Pashinyan traveled to France on a working visit on Thursday, September 13. Gladys Berejiklian has become the first elected female Premier of Australia’s largest state of New South Wales.